These two high-end spec homes were created with no particular buyer in mind. 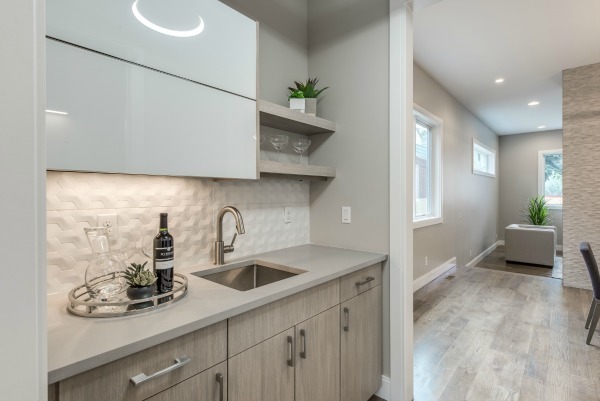 However, had a buyer purchased one of the homes prior to completion then the finishes would have been chosen for that buyer’s particular tastes and preferences. 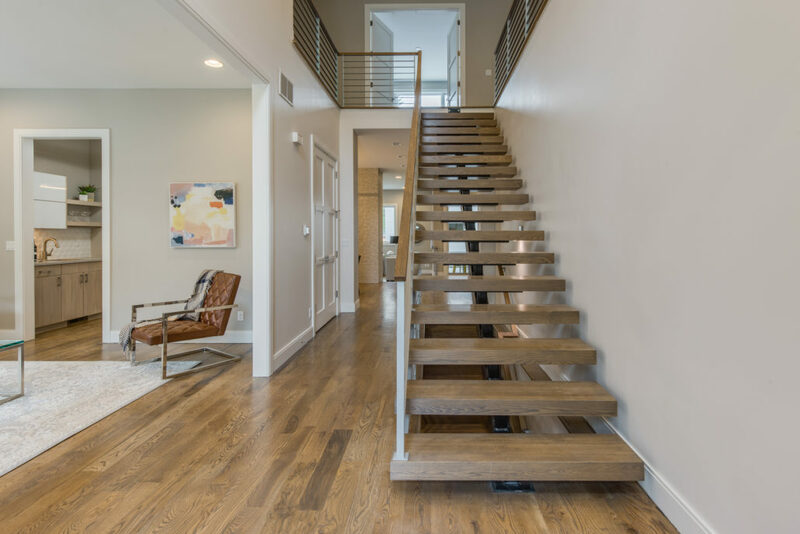 Without a buyer prior to the completion of the projects, the designer and developer proceeded to select finishes and make off the cuff design changes as the homes evolved. Each house boasts 5 to 6 bedrooms, 5 complete baths, and a powder room. Of the two homes, one beckoned a more modern overall design. Upon entering the home, it’s hard to miss the large central see-through fire place dividing the large dining area from the great room which drops down a step adding a notch of drama. Modern finishes maintain a classic feel throughout the house. “They’re design-forward, but not overly trendy,” Tanya points out. “I wanted the home to be modern, but classic as well.” Although her comment sounds nonchalant achieving this outcome, in general, is no easy task for an interior designer. So how did she do it? Balance and thoughtful color pairings. 3D tiles edge the kitchen counters along the walls creating a backsplash. Commonly, kitchens have mosaic tile backsplashes, but the 3D tiles are more interesting and on trend. With the added texture, bold statement colors could have been overkill. Tanya selected subtle colors that complemented, rather than competed, with the 3D tile. Reflecting the kitchen backsplash, the different 3D frame the fire place from frame to edge. The look is dramatic but not in a way that’s overwhelming. The kitchen created some design challenges, but with some creative thinking the space became a social haven for its future owners. Originally, the architecture plans called for a large kitchen and large dining area but no nook or area to sit in the kitchen. As the social center of a home, a kitchen without seating feels constrained. Usually, the solution is to add stools or bar chairs on the back side of the island. However, the developer wanted a dining type feel that was more communal than a unilateral seating arrangement where a family could sit across from one another. So the solution was to add additional counter space allotted for additional seating. With a perpendicular counter-height quartz slab accommodating 2 stools on either side between the dining room and cooking space, the lighting became another challenge. The informal seating area now needed pendant lighting but initially the kitchen design called for 2 pendants on either side of the hood above the kitchen island. “It would have looked too cluttered to have multiple light fixtures over the island and attached dining,” Tanya reflects. In the end, she opted for minimalist flush mount cans on either side of the vent hood and chose a linear fixture over the dining portion. 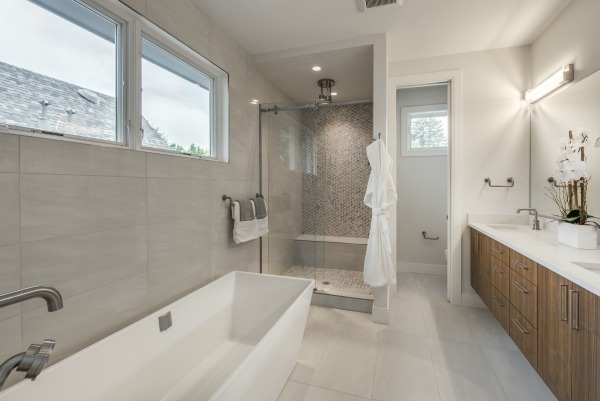 Unlike most spec homes that use the same finishes in every bathroom in order to keep costs controlled and project management simplified, this home features unique designs in each bathroom. Tanya’s favorite, and favorite space in the house altogether, is the master bathroom. Walnut cabinets warmly contrast the all-white color theme that coats the flooring, walls, countertops, and tiles. In the shower, tiles connect the tub to the shower and run from the floor to the ceiling creating a luxe, spa-like feel. The shower glass slides like a barn door, versus swinging in and out, resolving any space conflict with the freestanding tub, but also looks very sleek. An accent of gray mosaic tiles on the back wall adds an interesting feature that creates a subdued focal point, yet the encompassing design remains fresh, classic, and timeless. 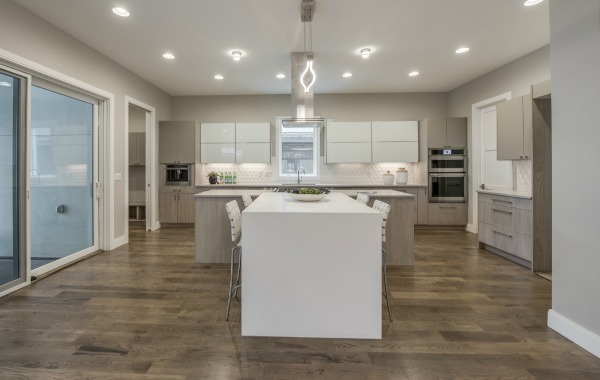 If you are a builder looking to develop new homes in Denver that will appeal to high-end buyers or if you are a homeowner looking for fresh and modern interior design please contact us by filling out our form or call us for a consultation at 303-489-9958.